An open letter to the NYT Public Editor: why has the Times ignored Forest City Ratner's "incredible" bailout of ACORN? I know you’ve steered clear of previous requests to look into the complicated, vexing question of the impact on Times coverage from the parent New York Times Company’s relationship with developer Forest City Ratner (FCR), which together built the Times Tower in Midtown--a relationship that has drawn critical scrutiny from Editor & Publisher's ethics columnist. 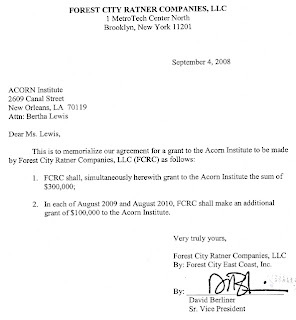 As you read on, you’ll find evidence that a Times reporter knew of (and was alarmed by) a $1.5 million loan/grant that Brooklyn-based FCR gave last August to ACORN, the Association of Community Organizations for Reform Now, which had suffered severe cash flow difficulties in the wake of an embezzlement scandal. Also, as the Times reported 10/22/08, ACORN's budget has been suffering, as it apparently owes taxes to federal and state authorities while foundations that previously supported the organization have backed off. Meanwhile, two board members, both members of a committee established to lead ACORN through its turmoil, have sued the organization, charging that ACORN was destroying financial documents and covering up improper expenditures. The Times chose not to report on that crucial loan. But that FCR-ACORN relationship remains worthy of sunlight, given the crucial partnership between FCR and ACORN’s New York affiliate in the enormously controversial Atlantic Yards project in Brooklyn. I know that Times Public Editors do not address coverage published before their term, so there’s much regarding FCR and Atlantic Yards outside your bailiwick. This time, however, I don’t think you can give it a pass. I and others have argued that the Times has failed to be exacting in its coverage of FCR, whose most prominent project is Atlantic Yards, which would include an arena for the relocated New Jersey Nets, plus 16 towers. In fact, Atlantic Yards is one of only two projects that FCR’s parent, Cleveland-based Forest City Enterprises (FCE), aims to start this year--a sign both of FCE’s severe slowdown in the current economy as well as the importance of the Brooklyn project. Atlantic Yards is controversial for numerous reasons, notably a significant amount of public support (direct subsidies, plus tax breaks) and an approval process seen as favoring FCR. Without bidding, Forest City defined the 22 acres at issue (public property and private property vulnerable to seizure via eminent domain) and city and state officials backed an approval process by the Empire State Development Corporation (ESDC). The ESDC has the power to override zoning, declare blight (despite the presence of million-dollar condos inside and adjacent to the footprint) and pursue eminent domain, all without any input from local elected officials, unlike typical city land use procedures. While Atlantic Yards received its official approval in December 2006, the project has been stalled, in part because of pending legal cases, but also because FCR and its parent, Forest City Enterprises (FCE), have experienced severe cash flow difficulties. 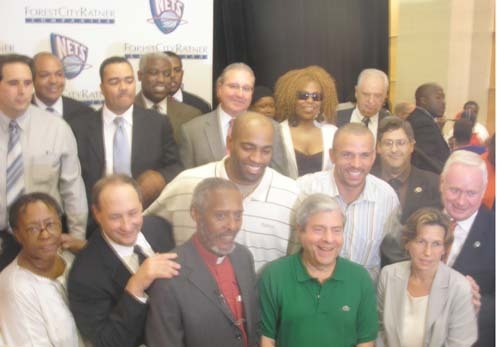 FCR CEO Bruce Ratner and FCE are majority owners of the Nets, which lose $30 million-plus a year. A new arena, designed at least nominally by architect Frank Gehry (who has laid off his staff working on the project), would be crucial to stop those losses. There’s a December deadline to issue tax-exempt bonds under the same controversial financing scheme that was allowed for Yankee Stadium but has since been disallowed for all other projects. As you can see, the stakes are high. I'm sure you've been contacted in the wake of Bill O'Reilly's report on Fox News (video here; criticism here), based on email and phone messages from Times reporter Strom to a source, that the Times sat on revelations that the campaign of Barack Obama was far more reliant on ACORN than he let on. It’s worth looking into, but to some degree, the Times’s alleged misdeeds are moot; Obama has been elected. But another angle of that story is very much alive. The same emails reveal that Times national desk reporter Strom was quite interested in another angle, the grant/loan ACORN received from FCR. I’ll explain that sequence in detail below, but first, more background. Of the various community groups backing Atlantic Yards, ACORN has the largest following and, despite a history of controversy, the most community legitimacy. 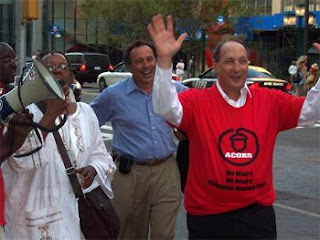 ACORN on 5/17/05 signed a Housing Memorandum of Understanding (MOU) that promised 2250 units of “affordable housing” in the project, which Lewis considered a huge victory. In exchange, ACORN agreed to publicly back the project--and has continued to do so, despite many reasons to doubt FCR’s promises. That promise, while on its face far superior to other projects in the area, was nonetheless enormously flawed. First, it was a bait-and-switch. When the affordable housing was announced in 2005, it was supposed to be a 50/50 plan: half affordable, half market-rate. However, the fine print--unreported at the time by the press--showed that the 50/50 plan applied only to rental units, which at that point were the only apartments contemplated. Shortly after the Housing MOU was signed, Forest City Ratner announced the addition of 2800 condos. That number, in the plan approved by the state, was since been reduced to 1930--and could change, given economics--but the fact remains: there’s no 50/50 plan any more. ACORN nonetheless defended the plan. Why? The institutional (and financial) boost to ACORN from managing such a large portion of affordable housing would be significant. But did ACORN deliver for its members? Of the “affordable” rentals, 900 (40%) would be rented to middle- and moderate-income households, at rates that are currently at or even higher than market. Another 900 (40%) would be rented to low-income households, ACORN’s constituency. In other words, ACORN members came out for public hearings to support a project that might not deliver for them (as they complained at a July 2006 affordable housing information session), but might do more for ACORN as an institution. Moreover, state officials now acknowledge--as critics and even supporters have warned--that Atlantic Yards would take at least two decades to build, not ten years. Let’s do some math. Counting from 2005, when the MOU was signed, that’s a minimum of 24 years to achieve those 900 units. Building 37.5 units a year, especially when Atlantic Yards likely would cause displacement of low-rent tenants in adjacent neighborhoods, would not solve the affordable housing challenge. But that “affordable housing” was crucial for public and institutional support, and even became Forest City Ratner’s public relations mantra. However, there’s a crucial difference between the way affordable housing was approved in this case. In recent years, the city has pursued neighborhood rezonings or even spot rezonings, offering developers the opportunity to build increased density in exchange for including a percentage of affordable housing. In those cases, the rezoning must be approved by the City Council via the city’s Uniform Land Use Review Procedure (ULURP). No such process occurred with Atlantic Yards. In essence, Forest City Ratner, with the partnership of ACORN, achieved a privately negotiated affordable housing bonus. ACORN and seven other community groups also signed the Community Benefits Agreement (CBA), which the developer has wielded as a p.r. tool and project supporters like Mayor Mike Bloomberg and Brooklyn Borough President Marty Markowitz have hyperbolically praised for its promises regarding affordable housing, job training, and minority contracting, among other benefits. The CBA also lacks enforceability; the provisions are difficult to enforce on their face and do not apply to a successor, so they may be completely unenforceable should FCR sell the project. New York ACORN has provided numerous supporters to testify and demonstrate for the project at public hearings. Atlantic Yards has since become delayed, by a combination of the developer’s business decisions and the economy, though there’s much evidence that the long-promised project schedule, promoted by the developer and endorsed by ACORN, was a fantasy. State approval documents signed in December 2006 anticipated a ten-year buildout for the entire project, achieving such benefits as affordable housing and open space. However, state and city funding agreements, signed nine months later (and before the economic downturn), give the developer a generous leash: should the arena be delayed, penalties kick in only six years after the delivery of property via eminent domain. There is no timetable at all for the 11 towers of Phase 2. In other words, the affordable housing pledge is a mirage. 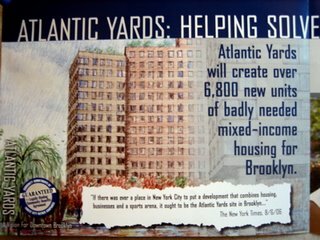 As long as the Project will include the ACORN/ATLANTIC YARDS 50/50 Program as described in paragraph 1, ACORN agrees to take reasonable steps to publicly support the Project by, among other things, appearing with the developer before the Public Parties, community organizations and the media as part of a coordinated effort to realize and advance the Project and the contemplated creation of affordable housing. While the Project no longer contemplates the 50/50 Program, Lewis and ACORN continue to support the project. Indeed, Lewis got her organization $1.5 million from Forest City Ratner, money that may not have been available from other sources. The loan would be newsworthy unto itself. How frequently does a controversial real estate developer, who does its work regionally, bail out a struggling national activist organization, one which saw contributions decline—and faced a major tax bill--after the revelation that Dale Rathke, the brother of longtime chief organizer Wade Rathke, embezzled nearly $1 million? 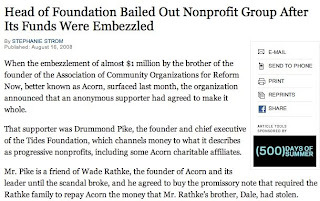 Moreover, the amount of the grant/loan was even more than the sum ACORN quietly received from a supporter to pay Dale Rathke's bill. The Times covered the latter payment. The Times ran an 8/16/08 article, headlined Head of Foundation Bailed Out Nonprofit Group After Its Funds Were Embezzled, about the organization's first bailout. Simple parallelism suggests the follow-story would be newsworthy. I even revised the text to suggest how it would work. Layer on the struggling Atlantic Yards project, which ACORN has reflexively supported, even as promises of affordable housing become ever more distant. The gift and loan seem to run afoul of the standards experts say both sides of a CBA should maintain. “Anytime you have negotiations in which there are competing self-interests, and one side grants a favor to the other, that’s a red flag,” Greg LeRoy of Good Jobs First told the Brooklyn Paper in September 2005. Add to that the whiff of impropriety regarding the loan. 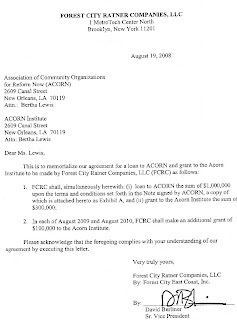 FCR agreed on 8/19/08 to loan ACORN $1 million and give the ACORN Institute $300,000 at that time and then $100,000 in August of 2009 and August 2010. The agreement between Lewis and FCR was signed 9/4/08. However, on 9/25/08, Lewis, confirmed the loan to the New York Times, stating that the loan was signed on 9/8/08 and dispersed around 9/12/08. Not everybody inside ACORN was happy with the loan, which was granted at an annual interest rate of 4.58%, with 36 monthly payments from 6/1/09 through 5/31/11. If ACORN missed payments, after 30 days the interest rate would rise to an annual rate of 18%. Some considered the apparent after-the-fact approval a violation of the group’s bylaws. “This is incredible,” Strom wrote to former ACORN employee Anita MonCrief, her then-confidential source, who has since supplied reporters with documents from their correspondence. Lewis then told Strom the loan was in place. “Maybe she misspoke?” Strom wrote MonCrierf regarding Lewis’s assertion that the loan was granted 9/8/08. Perhaps Lewis did misspeak; even so, it would be worth checking with other board members—and, no matter the result, the loan would be worthy of coverage. Note that whistleblower MonCrief is not without an ax to grind—she was was fired from ACORN for using a credit card for personal expenses, as she explains--but says she's motivated by idealism. She supported Obama’s campaign. MonCrief decided to make public what Strom considered confidential reporter-source communication. As a reporter, I’m not very comfortable with that, but, given that the story had already emerged, I'd rather offer the full context. On 10/21/08, regarding the Obama story, Strom left a voice mail, as broadcast on the O'Reilly show, saying, “Hi, Anita. It's Stephanie. I have just been asked by my bosses to stand down. Ah, we're running a story tonight for tomorrow that, ah, pretty well lays out the partisanship problems that Project Vote may have, ah, based on a report that I got. So, ah, they think that going to do, — that's going to be the story about the partisanship issue, and so they want me to hold off on coming to Washington [to meet with MonCrief]. Sorry, I take my orders from higher up...ah...sometimes." [Updated] While that full text explains more why Strom was told to desist with the Obama angle, it still suggests that Strom and her editors were at odds. And there’s no evidence editors interfered with Strom’s reporting regarding ACORN’s link to Forest City Ratner. But Strom and her editors still could be asked by the Public Editor why they didn’t pursue the story. I asked the Times spokeswoman, Catherine Mathis, why the Times hadn't covered the FCR loan to ACORN. Her response was unsurprising boilerplate: "Forest City Ratner's association with ACORN on the Atlantic Yards project has been reported in The Times. We continue to report developments when we judge them newsworthy." Sure, we all know editors and reporters exercise judgment regarding what to cover, and the amount of attention and space to devote. In this case, I believe, it's imperative that you take a second look and fulfill one of the most important and sensitive responsibilities of your office, to look without fear and favor into whether the Times Company’s business relationships bear on the newspaper’s coverage. Not only should the Times have covered the FCR/ACORN bailout, it still has the opportunity to do so. Such coverage would explain why an embattled organization has such an unusual ally, and why the two are willing to help each other. Apparently the Times considered writing about the ACORN-FCR loan but decided against it. That suggests either poor news judgment or perhaps judgment clouded by the business relationship. As I’ve written, the Times has an obligation to cover Forest City Ratner exactingly. And when the Times doesn’t do so, there’s a role for the Public Editor. But Mr. Oder's criticism of [whistleblower] MonCrief for "decid[ing] to make public what [NY Times reporter] Strom considered confidential reporter-source communication" is based on a fundamental misunderstanding of privileged communications. I should have amplified my analysis. "I thought we had an agreement to speak off the record," Strom said in one email to MonCrief. There's no evidence from the emails that there was a formal agreement to be violated and Strom continued friendly communication with MonCrief after that complaint, so she clearly did not feel she had any serious recourse. Nor has Strom, nor anyone else, charged MonCrief with providing inaccurate information. As a whistleblower, MonCrief has gone out on a limb to challenge some large institutions. Apparently Strom, like many reporters, assumed that reporter-source communications were implicitly (not legally) confidential. MonCrief, a neophyte at the time at dealing with the press, told me she did not share that assumption, and does not recall any such request by Strom. As a reporter, I do not formally ensure that that every communication with my sources is off-the-record; indeed, journalists often operate under an implicit agreement of mutual confidentiality. Maybe that assumption should be revisited and reporters might take more care in their interaction with sources. The cost may be burdening reporter-source interactions with a new level of formality. Time to rethink arena revenue assumptions? What about that 850,000 square foot arena? Lupica: Nets to Willets Point?